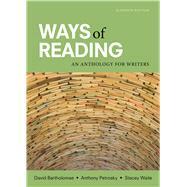 Since its first edition, Ways of Reading has offered a uniquely exciting approach to first-year composition, integrating reading, writing, and critical thinking with a challenging selection of readings and editorial support. By engaging students in conversations with key academic and cultural texts, Ways of Reading helps students develop the intellectual skills necessary for academic work; it also bridges the gap between contemporary critical theory and composition so that instructors can connect their own scholarly work with their teaching. With a mix of shorter, more accessible readings from a broader range of academic disciplines, the eleventh edition offers more flexibility for instructors while continuing to help students become better writers by challenging them to be engaged and critical readers. David Bartholomae and Anthony Petrosky are both of the University of Pittsburgh. Highly regarded members of the composition community, together they have published Facts, Artifacts, and Counterfacts: Theory and Method for a Reading and Writing Course (1986), The Teaching of Writing: Eighty-fifth Yearbook of the National Society for the Study of Education (1986), and Ways of Reading: An Anthology for Writers (Bedford/St. Martin's, 2002).